Our flock is a mix of Romeldale/CVM, Leicester (pronounced “lester”) Longwools, Romney and several crossbred fiber ewes. All sheep are coated year-round to produce a clean, beautiful fleece with very little vegetable matter. We shear about once a year. The heavily skirted raw fleeces are available for purchase and are perfect for handspinners looking for top quality fiber. We also have roving and combed top available. 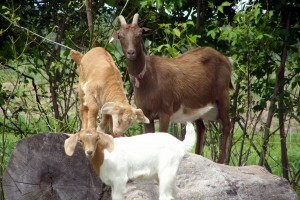 Each year we have a limited number of breeding stock or fiber sheep for sale. Leicester Longwool: A critically rare sheep reintroduced into the United States 25 years ago. Our sheep our both white and natural colored with beautiful long (up to 14 inches a year) locks with lots of luster. The fleece is coarser which makes it perfect for weaving, rugs and knitted/crocheted articles that benefit from more sturdy yarn. We have both purebred and crossbred Leicester Longwools. Romeldale/CVM: Another critically rare sheep with less than 500 purebreds in the United States. Their fine wool is so soft it can be used for next-to-the-skin items. Romeldale/CVMs have many different markings and shades of natural color in their wool that each fleece is gorgeously unique. Our flock has both purebred and crossbred Romeldale/CVMs. Romney: The only sheep breed in our flock that isn’t rare or critically endangered but will always have a place at our farm because of their wonderful personality and disposition. They have the finest fleece of all the longwools, with a lovely luster and uniform crimp. The wool can be used for items like outwear, sweaters and rugs. 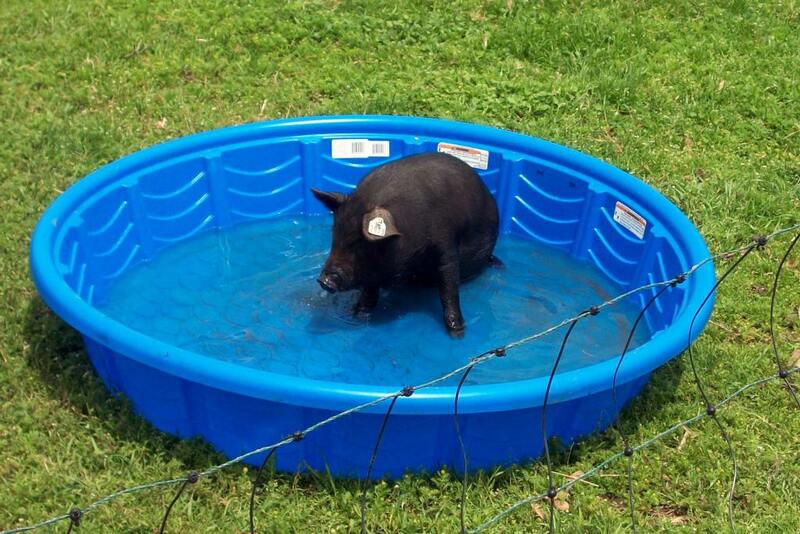 We raise a critically endangered heritage breed pig called American Guinea Hog. 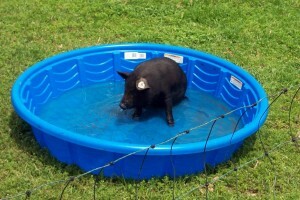 They are smaller than the “standard” pigs, thrive on pasture, and are perfect for a “homesteader”. They are known for their sweet and calm tempers as well as their tasty pork! Currently, we have several sows (mom), a boar (dad), piglets and “teenagers” running around the fields. Our pigs are carefully tracked to help us select a small number to sell as breeding stock with the rest sold as feeder pigs or raised on our farm to be sold as delicious pastured pork. 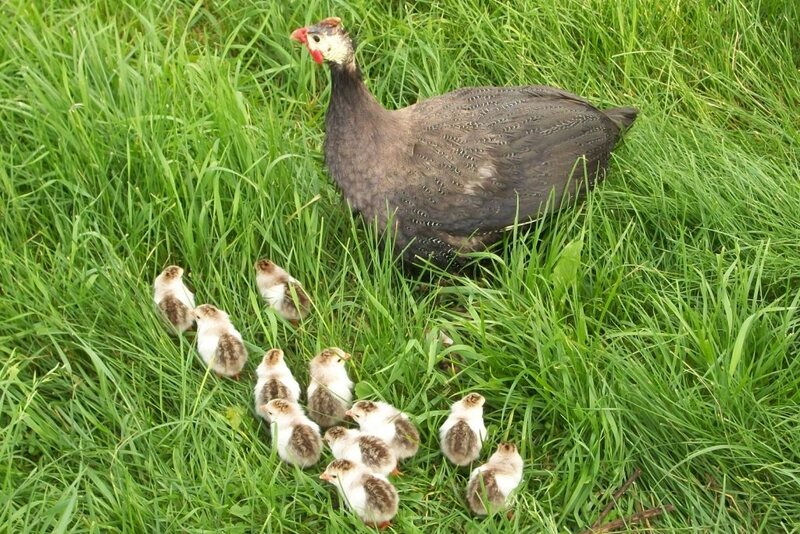 We name every animal on our farm but it is very difficult to individually name 100 chickens that all look alike. So we lovingly call our meat chickens “The Chicken Nuggets”. 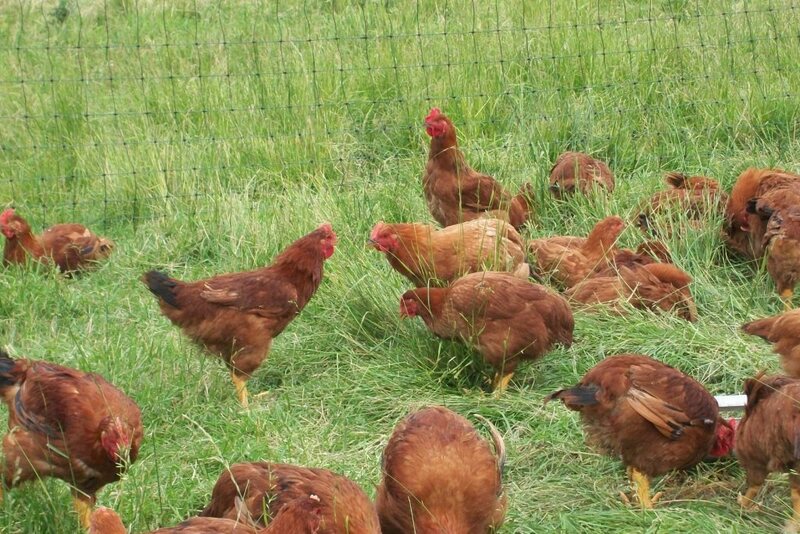 We raise a breed of chickens called Freedom Rangers which are known for their ability to do well on pasture. 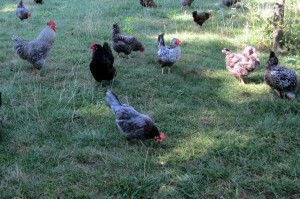 The chickens are out in the fields where they can wander around, soaking up the sunshine. They spend the days roaming around the fields and nights in a portable hoop house due to local raccoons who love chicken dinners. They hang out eating bugs, seeds, and locally produced organic feed. They are then sold directly from the farm. 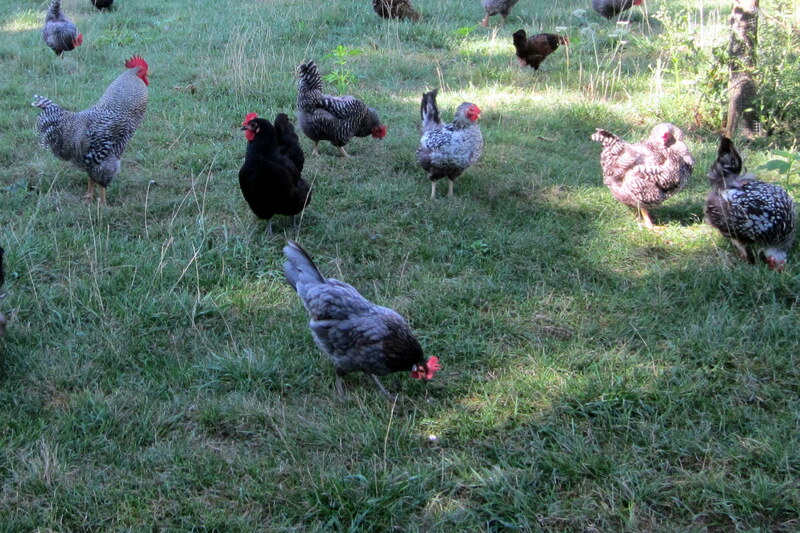 Our flock of laying hens free-range all day long, eating bugs, seeds, and plants. Because of this diet, supplemented with locally produced organic feed, the egg yolks are a stunning bright orange color. They taste so much better than factory-farmed eggs! We have a few roosters who protect the hens from danger and help give us fertilized eggs which we can sell or let the hens raise themselves. We have several hives that supply us with more than enough honey for ourselves and to sell. We help them out with organic interventions if they really need it but we try to let them do their own thing. During late summer, we harvest the delicious honey by simply straining it (never heating it). 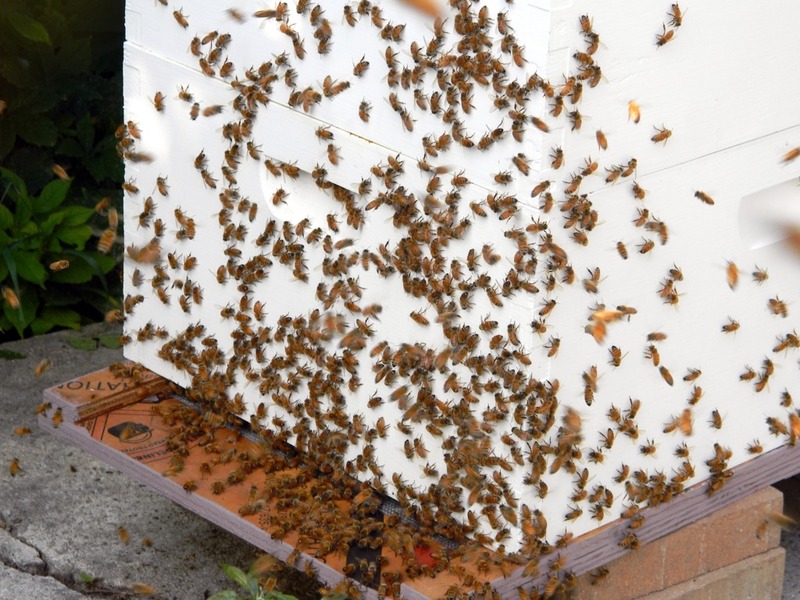 Each year, our honey has unique flavors depending on what plants were blooming when the bees were making the honey. 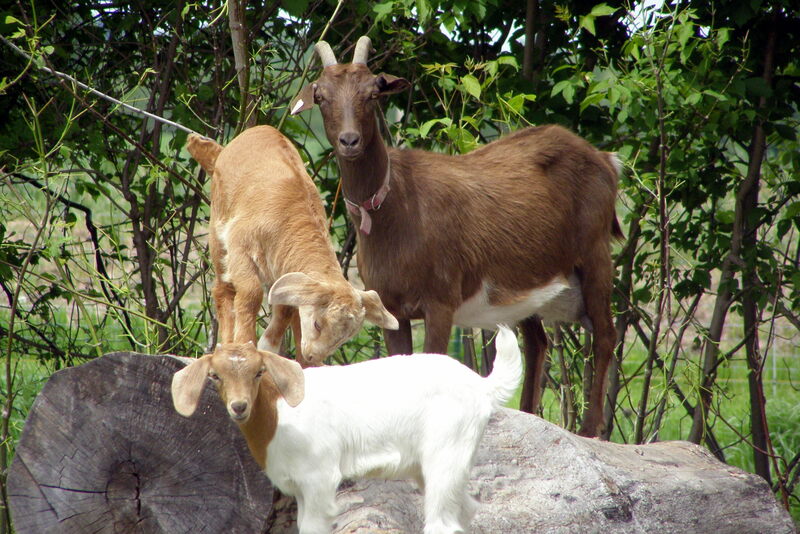 Our dairy goats provide us with all the milk we need for handmade soaps. They can be a little spunky now and then but we love sharing our farm with them. When they aren’t being milked, they enjoy hanging out in the fields and help with weed and brush management. 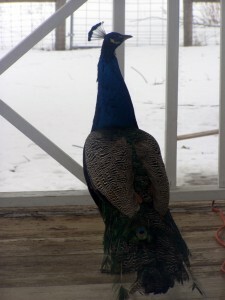 One summer, a peahen (girls=peahen, boys=peacock) wandered onto the farm and adopted us. We named her Eunice. 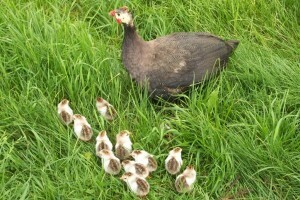 She hung out with the laying hens and guineas but we still felt like she needed a peafowl family. We have since gotten her some friends and now have a small flock. Their job on the farm is to simply wander around, looking beautiful and providing inspiration to us all!